Ballagh Studio is situated in the most northerly region of Ireland in the picturesque Inishowen penninsula. It is a 45 minute drive from Derry in Northern Ireland and a few minutes from Malin village. Directions from Derry: follow signs to Muff and Moville, take a left at Quiqley’s Point towards Carndonagh. Carry on straight through the town of Carndonagh to Malin. 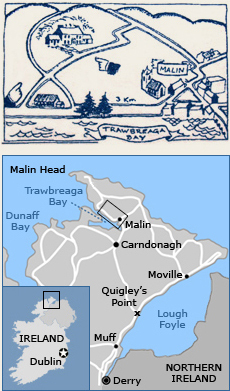 On entering Malin, turn left on the coast road along Trawbreaga Bay and continue for 3km (2mi). Just after the church, turn right and continue on straight for 1.5km (1mi) until you see the sign for Ballagh Studio on your left.